Genesis Gaming, a well-known software developer in the online gambling market has announced the release of two new video slots for the month of September. The first to be released is Bier Fest while Escape Artist will be the second slot to be released this month. Bier Fest is a 5 reel, 25 payline slot featuring an Oktoberfest theme. Those playing this game will truly feel as if they’re in Germany thanks to the German music, by standing drinkers, beer maidens and more. While venturing through this slot expanding wilds, stacked wilds and two bonus rounds will be available to be triggered. Escape Artist on the other hand is 5 reel, all payline video slot portraying a spooky theme. Various ghouls and monsters will appear on the reels as icons. A variety of these icons can trigger free spins, scatters, wilds and a bonus round. Genesis Gaming’s James Watson stated, “Both of these games offer elements of humor and excitement. There is plenty of entertainment available for players. We’ve created a story that builds in suspense with each spin & the compelling bonus features of both these games will be more rewarding thanks to that story.” It seems that Bier Fest & Escape Artist mark a new moment for Genesis Gaming. Just as so many other software developers they’ve begun to create more story oriented slots. There is no specific release dates for either one of the games, it’s known that both will be released this month. 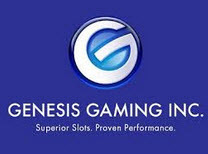 Register an account with a Genesis Gaming licensed casino & experience these games soon.